In a first of its kind, Indian school students have launched ‘Depression Helpline’ for suicide prevention. Purely a brainchild of Sainik School Purulia alumni, the facility will act as first level support for any alumnus depressed for any reason. The ex-students of this military school in West Bengal had earlier launched the Students Welfare and Inspiration Foundation Trust (SSP-SWIFT). After successful execution of similar pro-active progressive initiatives, the latest effort has been announced on the World Suicide Prevention Day i.e. September 10, 2013. The alumni decided to pilot the helpline to counter increasing stress in the life of young people mainly due to pressure of jobs and careers. The Depression Helpline team is spread worldwide and includes alumni with depth of experience in a variety of situations and professions. Mentors include Arun Kumar Shaw (Hyderabad), Sukhen Jana (Jalandhar), Suraj Kumar, Prashant Vimal, Sawan Chaudhry (NCR), Santosh Sharma (Mumbai), Mukesh Prasad (Bangalore) and Avinash Kumar (North America). During the conversations, the mentors would prioritise to make callers feel better and then refer to a local qualified psychologist, if necessary. They will also help the person if the cause appears to be academic or career-related via their network and expertise. 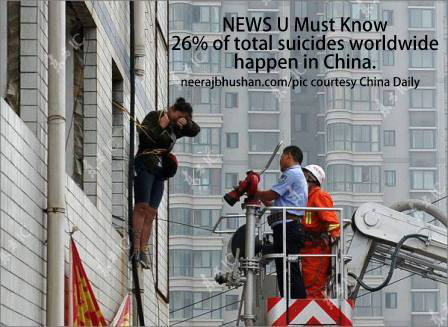 The Helpline number in India is 08699403952. 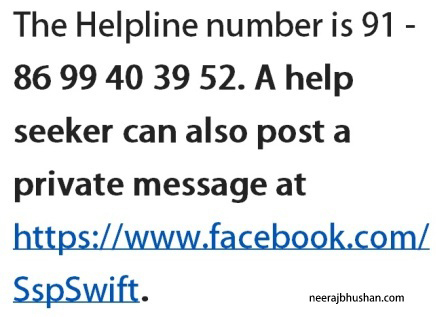 A help seeker can also post a private message at https://www.facebook.com/SspSwift. The Helpline promises to maintain confidentiality. This Helpline is a complementary effort to the already popular career guidance series of events titled ‘Lakshya’ by SSP-SWIFT. While Kargil War Hero Sqn. Ldr. (retd) Prajesh Banerjee, a resident of Durgapur is the Lead Mentor, Global OD and India HR Head of GlobalLogic Capt. (retd) Sanjay Mitra is among many mentors to the programme. Y.N.Rai, a Commandant with CRPF and school’s first recipient of President Police Medal for Gallantry, is among the programme advisors. O this is so commendable. Mighty Congrats.